Never mind what the regulators have been hinting, I really cannot imagine that T-Mobile customers are all that excited about a possible merger with Sprint either. On one side, you have a glistening beacon of competition which, as the smallest of the "big four," has managed to transform the wireless industry in the United States in less than a year. On the other side, you have a hemorrhaging patient being stitched together with a hodge-podge of different networks. When it comes to making money, I’m on the side of “more.” For Deutsche Telekom, the company would be serving its shareholders pretty well if it manages to get $40 billion-ish for its stake in T-Mobile USA. If Masayoshi Son wants to spend SoftBank’s money on such a venture, have at it. In the world of mergers and acquisitions, and big business, I really do not have much of a problem with such deals. As someone who digs competition however, I am not thrilled with the idea. As someone who has been a customer of both these carriers (as well as Verizon and AT&T), albeit for short periods of time, I am really not thrilled with the idea. As someone looking in from the outside at the relative cultures of two companies, I am really, really not thrilled with the idea of a T-Sprint or SprinT-Mobile or whatever they call it. Verizon and AT&T control two thirds of the US mobile market, and basically 100% of the profits. If Sprint and T-Mobile combine, none of that changes. The two companies would be larger, but T-Mobile, despite its amazing subscriber growth, is barely making any money, or none at all, and Sprint, just isn’t making any money or gaining any customers and hasn’t been for years. 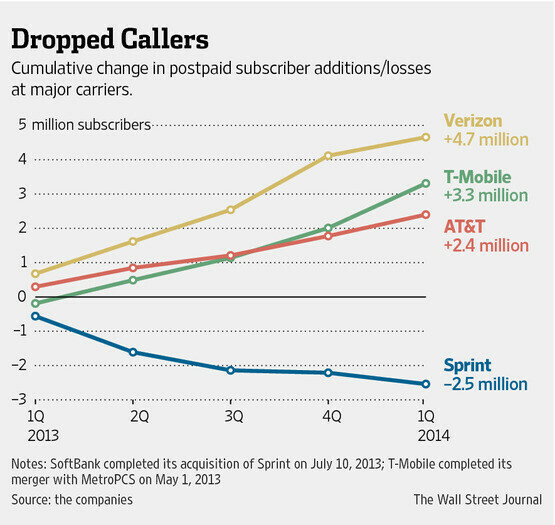 So, in gaining T-Mobile, Sprint simply gains more overhead. Speaking of overhead, what happens when a company is contending with too much overhead? You lay people off and you close down stores. 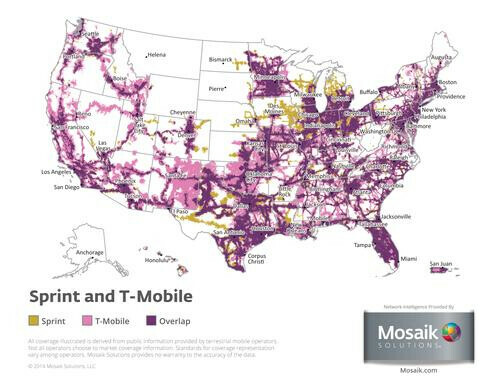 While it would be technically inaccurate to say that where there is a Sprint store there is also a T-Mobile store, it is not inaccurate to say that there are plenty of places where a combined company will have wholly duplicated operations at common locations and regions when only one will be needed. Where there are 10 or 20 call centers, you will only need a fraction of that. Property managers and tower technicians, they’ll feel the pinch too. Two sales teams covering the same geographic territory, no more. So, regardless of what you hear, yes indeed, there will be a lot of people losing their jobs. Employees are the most expensive cost on any company's normal balance sheet. Then there is the matter of how the combined company would continue growing its customer base. Even with John Legere at the helm to be the business evangelist and let’s assume that current T-Mobile CTO Neville Ray, who orchestrated the spectrum changeover with MetroPCS, how would a combined company effectively manage Sprint’s CDMA, FD-LTE, TD-LTE, left-over WiMAX network, and build a base on top of T-Mobile’s GSM/HSPA and LTE network? One thing this merger is not about is coverage. Neither carrier has much of an advantage over the other. Both incumbent networks were built from the ground up after the PCS (1900MHz) auctions in the 1990s. One could make the argument about spectrum, T-Mobile holds more “low-band” spectrum (less than 1000MHz) than Sprint, but given that both networks are a virtual overlap, regulators are certainly going to mandate some significant divestiture of licenses in major markets, particularly in California, Texas, and Florida, three of the biggest states in the Union. Doing a T-Mobile/MetroPCS strategy, a-la migrate users to one network, then shut down the other, is possible, but it would be a daunting undertaking. It was feasible with MetroPCS because the carrier had a little less than 10 million subscribers. T-Mobile was able to accomplish the feat ahead of schedule, while giving itself about 2 years to do the job. Migrating 50 million subscribers in one direction or the other would be cost prohibitive, and very slow unless you just starting giving truckloads of equipment away (thus pressuring further the non-existent profits in either company). What about the auction in 2015? All that beach-front 600MHz spectrum is going to be up for grabs. The FCC even wrote in rules favoring smaller carriers in markets where AT&T and Verizon have significant holdings already, just as what T-Mobile, Sprint, and the Competitive Carriers Associations lobbied for. It is indeed interesting that the regulators wrote in that those favors would be pretty much null and void if a “significant transaction” were to be announced. So, it would seem that John Legere and Dan Hesse weren’t standing up for the “little guy” despite all their lobbying of the FCC to get the auction rules written in. I may be seeing all this from the outside-looking-in, but it all looks like a tangle to me. 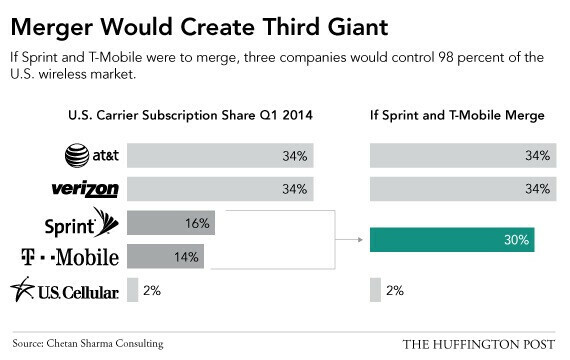 Instead of four carriers controlling 98% of the market, you would have three. That’s less competitive. The resulting fourth largest carrier would be US Cellular with 5 million customers. In fact, if I were to buy US Cellular, C Spire, nTelos, Cellcom, Alaska Wireless, SouthernLINC, Bluegrass Cellular, and Appalachian Wireless, the next biggest carriers in line, the combined company would still be smaller than MetroPCS was when it was acquired by T-Mobile, with just 7.6 million customers. There would be no more scalability in the market if these two companies merge. Even with John Legere at the helm, there is a much different owner in the picture, Masayoshi Son versus Deutsche Telekom, and given the far more conservative hand Son has played thus far with Sprint, versus what many expected, I am not convinced the two would get along all that well. Moreover, neither carrier gains any physical coverage. The end result is a carrier with north of 80 million customers, a heap of debt, and a network that is compiled of a whole bunch of incompatible standards. Legere’s vision and flexibility is offset by Sprint’s inflexibility, and T-Mobile’s subscriber growth is offset by Sprint’s losses. Also, remember my aforementioned view of job cuts, expect to see all the wrong people in the middle lose their jobs as relative teams jockey to justify their (continued) existence (you can look at just about any Dilbert comic as a reference). When these rumors about a possible merger first surfaced, I reasoned that given track records, it should be Sprint putting itself up for sale. John Legere has arguably not made a bad move in his short time at the helm of T-Mobile USA, though the subscriber gains need to turn into profits or it is all for naught. Sprint, on the other hand, has been making bad decisions since it bought Nextel. This deal is good for a few key people and a couple of companies. Dan Hesse and John Legere, as CEOs, along with a group of key executives, will get handsome paychecks from the deal (that’s good, I have no problem with people making money). The major shareholders of T-Mobile USA, most of which is Deutsche Telekom, and subsequently, its shareholders, are well served in any transaction. Interestingly, it could be shareholder disposition that might prove to be an impediment to SoftBank’s cash flow. SoftBank is a major owner of Alibaba, who is basically to Asia what Amazon is to the US. Alibaba is gearing up for an IPO that is going to raise a significant amount of money. However, Alibaba has been rather quiet about several details ahead of remaining regulatory filings that investors are interested in. The details are too far off topic, but Alibaba’s own acquisitions, and the way the company projects financial results for each business unit, coupled with relative silence about the make-up of other partners involved in the company and their voting power in Alibaba after it goes public. If anything were to hamper what is expected to be a record setting IPO, that will certainly have an impact on Masayoshi Son’s enthusiasm (or ability) to pay a premium for T-Mobile. 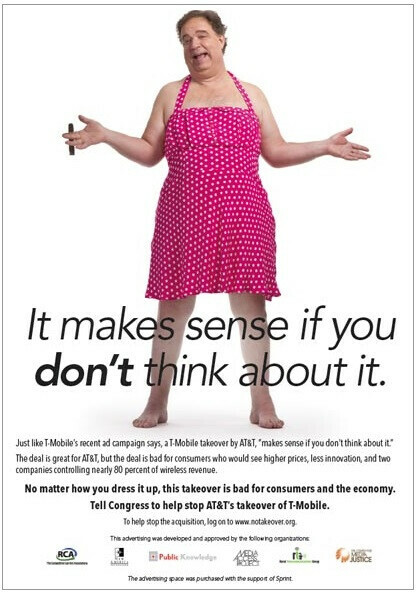 This is one of the ads that Sprint ran in its campaign to stop the AT&T buyout of T-Mobile - anything different this time? 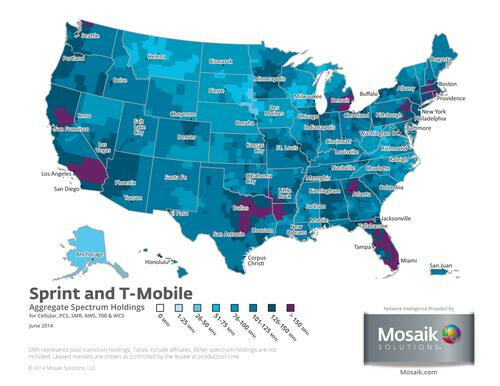 T-Mobile has been an invigorating game changer in what is a nearly saturated US market. How that dynamic alone may be affected by a T-Mobile-Sprint merger is something that should be examined by regulators no matter how much of the store Masayoshi Son promises to give away. Moreover, do not expect AT&T to take such a measure lying down. Sprint proved to be a massive thorn in AT&T’s side in its attempt to buy T-Mobile a few years ago, and that merger, though disliked by consumers, made a lot more sense. 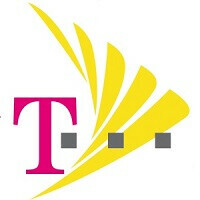 Don't be surprised if a lot of drama unfolds following any announcement by T-Mobile and Sprint. The final judge in all this will of course be the customers. The problem is that the resultant merger would indeed mean they have fewer choices to consider if they want to make a switch. If this deal goes through, it's a total insiders deal. It also proves that Masayoshi Son never intended to actually try and turn Sprint around. From every other angle it looks like they're trying to make a soup sandwich. All we're going to get is soggy bread. T-Mobile is a completely different company than they were a few years ago, so is Sprint but they are still not as good as they could be. Sprint and T Mobile merging is our best bet, this petition needs to be dissolved. It's called an "editorial" and yes, it is biased because the deal hurts everyone - consumers, the market, and employees because the layoffs would be massive. I'm a little confused on what is or isn't good for the consumer. We have two carriers struggling to compete with VZW and AT&T whose history to purchase and mop up smaller carriers left and right, has left very little room for growth. We have heard what Tmobile and Sprint are not doing correctly or shouldn't be doing, yet we haven't heard any suggestions on what they should do. It is almost as if we should just let AT&T and Verizon have all their way in the industry. This doesn't placate consumer advocacy either. We need another power. How do we culminate such an entity? I feel there needs to be a third super power to compete. Regardless of how we feel of the current standings of the two smaller carriers, I previously posted my opinion that consumers would percieve a larger subscriber base as formidable. I don't like, or even want to conceive the idea of job loss, but this industry(specifically in the United States) is heavily controlled by the two largest. It doesn't seem to be stopping. The government has no problem with them swallowing as many little carriers possible to make them what they are today, yet when the industry calls for a more balanced folcrum point, only then does the government throw a flag on the play. So my question is what do you propose Sprint and Tmobile do? John B. Great question John B.. As much as I like T mobile services where I live, I know they can't defeat VZ & ATT alone. Everyone iskidding themselves if the believe it can work without Tmobile and Sprint (god I hate them) merging.. But I'm sure Maxwell R. have the solution..please enlighten us on how to keep Tmobile and Sprint a float against the Mighty VZ and ATT?. You must work for Sprint. That is all. Maxwell R., Then what would be your thoughts on a Dish/T-Mobile merger? I beleave that one way or another Deutsche Telekom will find someone to buy out their share of T-Mo so that they can exit the US mobile market. Do you think that it will be more likely that Dish would make a move now for T-mobile now that AT&T has bought out Direct TV? Only if this Sprint/T-Mo deal gets stopped by regulators. As it is, Dish doesn't have the money to buy T-Mo at the current market cap. True...depends heavily on pricing though. .I'm with T-MOBILE right now...got 4 lines for what would be 2 at AT&T. So if prices rise after merger...I'd head back to big blue for better coverage ( Tmobile is a awesome in my area as well...best LTE speeds too). I know T Mobile has great prices - but, you can actually get a better deal with straight talk - at least for one line - 45.00 3 GB of high speed data, no overages, unlimited voice and unlimited messaging, per month. Also, AT&T has lowered its prices - 160.00 a month for 4 lines and you unlimited talk and messaging and 10GB of data. T Mobile does have a 4 line price of 100 and you get 1 GB of data, same talk and messaging. But, then with T Mobile, you can have 3GB per line of data, no overages and unlimited voice and messaging and pay 140.00 a month. I pay about 120 per month for 4 lines with unlimited voice and messaging with 500mb of high speed data per line and then it goes to slower speed. I like to stay no contract because of prices. No one in my family uses data except me and I barely use any. Is there a better deal? My fault...I have 1GB per line on all 4. The plan total is 100 per month, but with all regulatory fees and stuff it comes out to be 120 per month on my bill. Dish network buy T-Mobile plz. Most of the MetroPCS employees already have lost their jobs due to the T-Mobile merger and now another merger more people lose their jobs, real nice. The best part is how full of *ish they are when they announce the mergers and they tell everyone that everything will be fine and no one will lose their jobs. Real talk. I'd allow the merger to go through as long as they promise to keep every last job and bring every call center job to the U.S. from overseas, nothing less if I was the FCC, FTC, and/or the DOJ. You are correct merge do cause some people to lose their job; however, a company that goes bankrupt, causes everyone to lose their job, Metropcs and other small carriers can not compete against the two giants!. Hey Maxwell. You mad bro??? You spend the article bashing the merger for not making sense but then finish by saying it should've been Sprint for sale? Dumb and lazy. Obvious bias shows many hurt feelings. Why not report the fact of T-Mobile losing massive money in spite of their adds? Or that their adds have been more prepaid than anything? Get over yourself. How about you learn to comprehend what you read? "Verizon and AT&T control two thirds of the US mobile market, and basically 100% of the profits. If Sprint and T-Mobile combine, none of that changes. The two companies would be larger, but T-Mobile, despite its amazing subscriber growth, is barely making any money, or none at all,"